Help! My Dog Ate a Frog and I Don't Know What to Do! What should you do if you discover “my dog ate a frog”? Some dogs are particularly adventurous when it comes to food choices. So just about all dogs are capable of giving us a heart attack when we realize how disgusting that thing they just ate really was. What if your dog has eaten a frog? Aside from the grizzly nature of the discovery, your head is probably in a spin as to what to do next. Are frogs dangerous? Do I need to take my dog to the vet? Is my pooch going to die?! The situation can be worrying, to say the least. Let’s break it down, so that next time your dog presents evidence that they just ate a frog you know exactly what to do. Is It Safe for My Dog to Eat a Frog? The answer to this question largely depends on what type of frog your dog has eaten. There are many different types of frogs out there. Some are not technically frogs at all, but rather, toads. Different species of frogs and toads inhabit different parts of the world. Some are highly toxic, others are harmless. To list which species are toxic and which are not would result in a very lengthy article full of lists and descriptions which would take you too long to read through in an emergency situation. So, in this article, we’ll discuss some basics that will be helpful any time you find your dog has eaten a frog, whether it is poisonous or not. Even though it may seem gross, if your dog has come to you with the frog hanging out of their mouth, pop it in a bag or bottle to show the vet. That way your dog’s vet can determine what kind of frog your dog has eaten. If your dog starts to show signs of becoming ill, immediately administering first aid and seeking medical help is more important than collecting a “sample” of their amphibian victim. Even if you are sure the frog is not poisonous, it is a good idea to get in touch with the vet to describe the symptoms. The vet can help you decide on the best course of treatment, even if you don’t need to take your dog to the clinic. Frogs can also carry parasites which could infect your dog. Therefore, it’s good for your vet to know that your dog has eaten a frog. This may be important when diagnosing any future infections that could crop up. If you’re interested, you may want to acquaint yourself with the types of frogs and toads that inhabit your area. That way you can give the vet plenty of information. You’ll also be more prepared for an emergency if you know a particularly toxic type of frog or toad lives near you. My Dog Ate a Frog – What Should I Do? If your dog brings what is left of the frog to you as a gift, try taking it out of their mouth. Also, try to stay calm so that removing the frog or toad from your dog’s mouth does not become another issue all of its own! Next, wash out your dog’s mouth. Instead, dampen a cloth and wipe the inside your dog’s mouth and gums. Rinse the cloth thoroughly between each wipe and keep doing this for about 10 minutes. If the frog is poisonous, this could help remove some of the toxins before they are absorbed into your dog’s system. Often, toxins excreted from frogs and toads are quite sticky so wiping out your dog’s mouth may be quite effective in reducing the effect of poisoning. Then, if you can, collect a sample of the offending frog and get your dog to the vet. Give your vet as much information as possible about your dog. Take note of any symptoms and the order in which they appeared. Let your vet know about any pre-existing conditions your dog has and any medications they are on as well. What Symptoms Will My Dog Show If They Have Eaten a Frog? Your dog may be frothing at the mouth. This is quite common if a dog has ingested or even just licked a frog or toad. Frothing is a natural cleaning mechanism to help get rid of the toxins. Your dog is not necessarily about to die, but administering first aid quickly is still vital. This will lessen the chances of severe poisoning or death. Symptoms will vary according to the exact toxin a particular frog or toad produces, as well as the amount your dog ingested. If you’re unsure how severe the situation is, call your dog’s vet and describe the symptoms. They can advise you on first aid treatments, further symptoms to look out for, and what you should do next. Why Would My Dog Want to Eat a frog? We know that dogs are inherently curious. So, the noises and movements of a frog can be quite irresistible to them. Most dogs probably do not eat frogs out of hunger, it is more likely they have ended up ingesting the toxins by either licking or mouthing the frog in an attempt to play. Many types of frogs and toads burrow and live under the shelter of leaves. Considering dogs love to dig, the probability your dog will come across a frog or a toad when they are going about their adventures in the backyard is high. How to Stop My Dog from Trying to Eat a frog? Short of locking your dog inside all day there is little you can do to guarantee your dog won’t ever come into contact with a frog. Especially if you live in an area where frogs and toads are common. If you do live in an area with lots of frogs and toads, get to know where they tend to burrow and what time of day they are most active. It may be a good idea to restrict your dog’s access to these areas during times frogs and toads are likely to be hopping about their business. For instance, in Australia, the cane toad commonly causes grief to dogs. But most poisonings happen in the evening when toads are more active and dogs are playing in the yard. While it may help to know what species of frog and toad live in your area, you do not need to become an expert on the topic to treat your dog if they have eaten a frog. Remember that not all frogs are poisonous, but some are highly toxic or can carry parasites that could go on to infect your dog. For these reasons, it is a good idea to know some basic first aid. It is also a good idea to at the very least call your vet for advice, even if you think the frog is harmless. If your dog seems unwell, the best course of action is to take your dog to the vet as soon as possible. Unfortunately, frogs and toads are very appealing to dogs—anything that jumps like that looks like a whole lot of fun to a dog, especially they have found the offender while digging! Stopping your dog from eating them may be a challenge but having an action plan in place in case they do is definitely a must, particularly if your dog has a penchant for frogs. 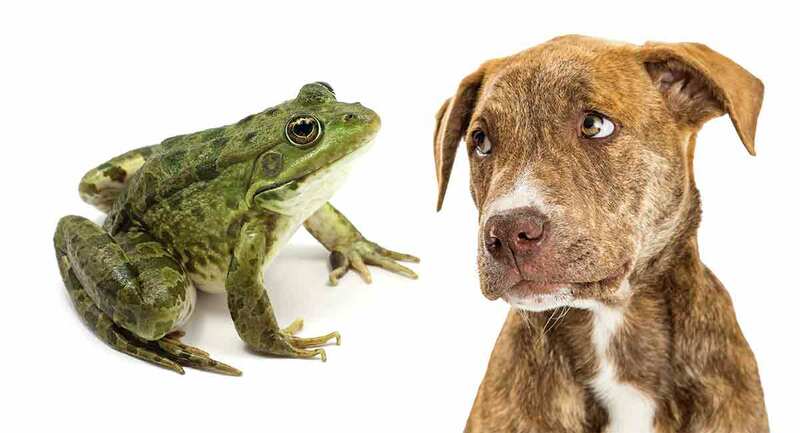 Has your dog ever eaten a frog? We’d love to hear about your experience in the comments below. Beyer TA, Pinckney RD, and Cooley AJ. 1999. Massive Dracunculus insignis infection in a dog. Journal of the American Veterinary Medical Association.